Emma of Normandy, twice Queen by her successive marriages to Aethelred II and Cnut, spent part of her life in exile under the protection of Count Baldwin of Flanders. To help promote the interests of her sons, Harthacnut and Edward (who became 'the Confessor'), she commissioned an exaggeratedly flattering biography of Cnut and herself around the time of Harthacnut's succession (1040). The 'Encomium' (panegyric or lofty praise) is an important early example of biography written in secular interests, in a period when 'lives' promoted sainthood, as well as providing a rare 11th-century narrative history. The only surviving medieval manuscript of the Encomium, this copy was made in Normandy, probably at St Omer and possibly for Emma herself. The narrative begins 'King of the Danes Svein [Forkbeard]', with the Danish king's name written in what once was a red pigment (red lead), now mostly decayed to a grey metallic appearance. The first letter is in the style of mid-11th century northern French manuscript decoration, made up of fantastic voracious beasts and grand foliage. 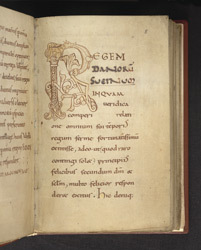 Rendered with pen and ink and minimal earth-tone colour, it resembles much contemporary Anglo-Saxon book decoration. The two areas were closely tied in politics and artistic culture in this period right before the Norman invasion.